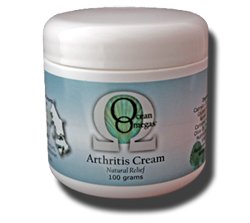 Rich in Omega 3, Ocean Omegas Arthritis Cream aids in the relief of joint & muscular pain caused by osteoarthritis. Ocean Omegas provides you with the highest quality Omega 3 & 9 oils which can provide you with arthritis relief. This is a natural treatment for arthritis. Hello, my name is Anne and I was given a jar of your Arthritis Cream to try. This cream is just magic. I am very happy with the results and will be ordering more in a few weeks time…. INGREDIENTS: Purified Water, Sweet Almond Oil, Caprylic-Capric Triglyceride, Polyoxethylated Fatty Acid Ester, Glyceryl Stearate, Glycerol, Sunflower Oil, Cetostaryl Alcohol HILB 8.9, Ceteareth 20, Silicone Fluid, Butyl Carbamic Acid, Lodopropynyl Ester, Glyceryl Monostearate, Lavender Oil, Olive Oil, Phenoxyethanol, Xanthan Gum, Alpha Tocopherol, Mutton Bird Oil, Eucalyptus Oil, Ginger Oil, Cocoa Butter, Shea Butter, Aloe Vera, Avocado Oil, Apricot Oil, Marjoram Oil, Lavender Oil, Juniper Berry Oil, Rosemary Oil, Wintergreen Oil, Cajuput Oil, Disodium Edta, Pine Oil, Peppermint Oil, Kunzea Oil, Fragrance.